I'm not a fan of April Fool's jokes so I'm not even gonna pretend that these are real, however, I WISH THEY WERE REAL. Squeez-Bacon - shut up, you know you'd try it. Hot Dog Hideaway - not bacon but so what, still an awesome idea. thanks for the NY Post link. i'm bummed that I missed out. Next year!!!! by the by, I was perusing yr myspace page and couldn't help but notice yr a Porcupine Tree fan. good stuff indeed. Love PT! And the NY Post link was actually about Top Chef - thought you'd be interested. Saw this post and thought of you. Bacon cupcakes (French Toast Cupcakes to be exact). 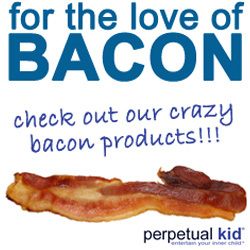 The guys at Bacon Salt got such an awesome response to their "joke" that they're considering making the lube FOR REAL. That is amazing news. I would totally buy it.